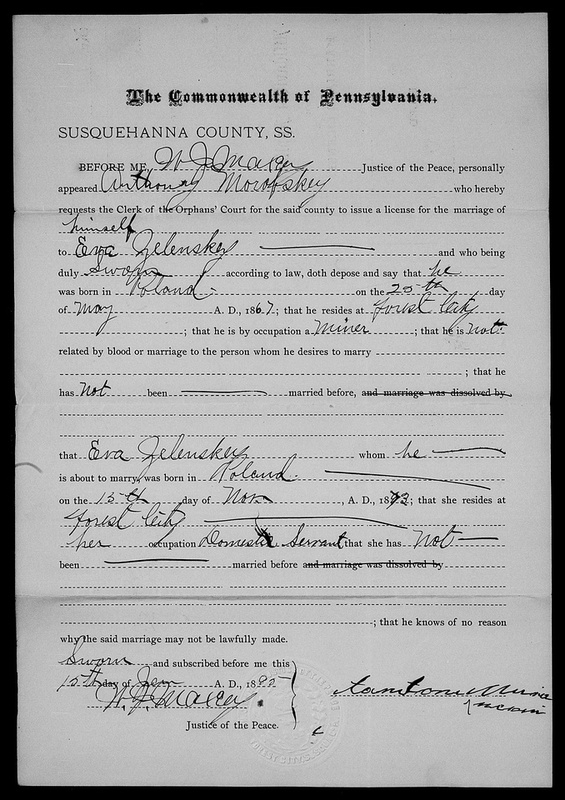 The application for marriage license for Anthony Murosky and Eva Zielinski was filed January 16, 1885 in Forest City, Susquehanna County, Pennsylvania. It was previously known from information included in the 1910 United States Federal Census that Anthony and Eva were married in Pennsylvania. The 1910 United States Federal Census also indicated that Anthony arrived in 1892 and Eva in 1894. Given their separate arrivals the couple met in the Forest City Community or by attending the same church. After locating the application for marriage license I shared with the folks at the website PolishOrigins.com. The researches at the site had some interesting observations, especially has they had assisted with translating the original Lithuanian names recorded on a birth certificate for Anthony and Eva's son Frank. To learn more about the translation visit the blog post The Original Lithuanian Spelling - Murauskas. The application for marriage license offers some previously unknown details about the Anthony and Eva - including some additional spelling variations of Murosky and Zelensky. This particular application for marriage license includes three pages - a cover page, the application for marriage license and a duplicate certificate. The first page in the file is the cover page. The cover page of the file lists the marriage application number, the names of the individuals to be married and the date the application was filed. Note the spelling Antoni Morofskey and Eva Zelenskey. Each name has an "ey" added to both surnames. This is the first instance I have observed of the 'f" being used in the surname. The use of the "f" in the surname may have been the name being recorded phonetically by the Justice of the Peace or a Clerk. Antoni would have very likely had an Eastern European accent. The second page is the marriage license application. The names on the license are recorded by the Justice of the Peace based by the matching hand writing. The names are recorded as Anthony Morofskey and Eva Zelenskey. The marriage license provides previously unknown details - birth dates for Anthony and Eva. 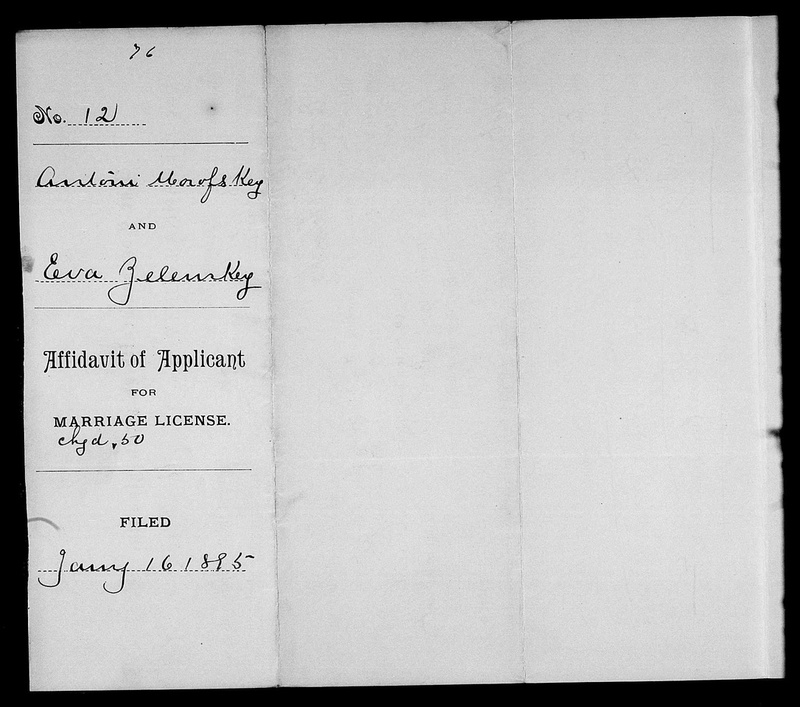 The marriage license indicates Anthony was born May 20, 1867 in Poland and that his occupation is a miner. This supports what was previously known about Anthony - that he worked as a coal miner in Forest City. The marriage license also indicates that Eva was born November 15, 1873 in Poland and that she was employed as a domestic servant. The birth certificate for Frank Murauskas indicated that Eva was working as a housekeeper in 1907. The birth reference location to Poland also aligns with other previously known details. The birth certificate for Frank Murauskas indicates that Anthony and Eva were born in the Suwałki Governorate. The Suwałki Governorate was an administrative unit of the Congress of Poland. The general use of Poland on the application for marriage license would have included this area. Signature of Anthony Murosky, Sr. The Justice of the Peace also spelled Anthony adding the "t" where the original signature does not include the "h". clear his real name starts with “Mur” and ends with “ki”. The third page in the file is the Duplicate Certificate. The duplicate certificate was completed by the Rev. F. Kuray and returned. The duplicate certificate indicates the couple was married January 22, 1895 in Forest City, Pennsylvania. This version of the spelling is Antoni Murofsky and Eva Zelenskey. Note that on three different pages in the same file the names have been spelled multiple ways. Antoni Morofskey, Anthony Morofskey and Antoni Murofsky. Antoni Murauskas and Ewa Zilinskaite are my 2nd great-grandparents. Their son Anthony Harry Murosky, Jr. is my great grandfather. Anthony Harry Murosky, Jr's s son Arthur Murosky is my paternal grandfather. "Pennsylvania, County Marriages, 1885-1950," index and images, FamilySearch (https://familysearch.org/pal:/MM9.3.1/TH-1951-21150-8097-73?cc=1589502 : accessed 2 May 2015), 004838983 > image 520 of 2047; county courthouses, Pennsylvania. "Pennsylvania, County Marriages, 1885-1950," index and images, FamilySearch (https://familysearch.org/pal:/MM9.3.1/TH-1951-21150-8105-4?cc=1589502 : accessed 2 May 2015), 004838983 > image 521 of 2047; county courthouses, Pennsylvania. "Pennsylvania, County Marriages, 1885-1950," index and images, FamilySearch (https://familysearch.org/pal:/MM9.3.1/TH-1942-21150-8511-99?cc=1589502 : accessed 2 May 2015), 004838983 > image 522 of 2047; county courthouses, Pennsylvania. "Pennsylvania, County Marriages, 1885-1950," index and images, FamilySearch (https://familysearch.org/pal:/MM9.3.1/TH-1951-21123-37079-92?cc=1589502 : accessed 2 May 2015), 004838912 > image 413 of 625; county courthouses, Pennsylvania. Ancestry.com. Pennsylvania, Birth Records, 1906-1908 [database on-line]. Provo, UT, USA: Ancestry.com Operations, Inc., 2015. Record for Frank Murauckas. 1930's - Helen and Edward V.